The Greek Theatre in Los Angeles will become "A Sonic Temple" on June 15 with a diverse multi-act bill that has roots in THE CULT lead singer Ian Astbury's pioneering pre-Lollapalooza festival "A Gathering of the Tribes" (1990). 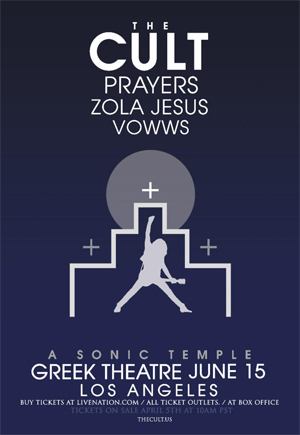 PRAYERS, ZOLA JESUS and VOWWS will join headliners THE CULT for this very special night that will also mark the 30th anniversary of the band's multi-platinum, game-changing album Sonic Temple. Tickets for the show go on sale Friday, April 5 at 10:00 AM (PT). Purchase tickets HERE. As with other shows on their May and June 2019 tour that's encompassing the U.S., U.K. and Canada, the British group that's led by Ian Astbury and guitarist Billy Duffy will perform a show drawing from their 10 studio albums, with the centerpiece being a super set that's focused on the core songs from Sonic Temple; some of these songs have not been performed since the album (their fourth) was originally released in 1989. Sonic Temple--a pivotal album that brought together the alternative and hard rock audiences--will be reissued in a 30th anniversary edition by Beggars Banquet Records (exact release date TBA). Sonic Temple features the singles "Fire Woman", "Edie (Ciao Baby)", "Sweet Soul Sister" and "Sun King". This gathering and celebration for fans of THE CULT--'A SONIC TEMPLE'--is an opportunity to come together for one truly memorable night. Meanwhile, the band expects to announce another block of dates very soon for 2019/2020. "We've never thrown a party like this before," says Astbury. "We want to celebrate the band's DNA and especially the album Sonic Temple as this year Beggars Banquet are planning a substantial reissue project." He adds: "PRAYERS and VOWWS have both toured with us and the timing felt right for bringing this group of artists together. In many ways I feel these artists are kindred spirits, along with ZOLA JESUS--outsiders who are unique and deeply romantic in a time of material posturing and disconnect. They are devoted to their craft; I identify with their honesty in performance and fearlessness and originality in their creativity. They are truly inspired and in harmony with now." Los Angeles is a key city for THE CULT. It's where Astbury and Duffy live and where they've played historic shows. "The Greek is an amazing theatre in our own adopted backyard where I've have seen amazing and diverse shows--Sinatra, the Pistols and Neil Young, for example," says Duffy. "I'm honored that THE CULT gets to walk the same stage as such legends in a beautiful historic outdoor setting." He adds: "We feel outdoor venues seem to warrant a longer show as folks like to attend early and stay late so to that end we have expanded the bill the make it a truly special night of diverse music." Astbury says: "L.A. has always been a muse since I was very young with the stories and myths spun out through film, literature, poetry, art and music that I was attracted to. It was and still is a city of refuge for British musicians; the lifestyle suited our needs and continues to do so. Hearing a wild coyote or seeing the snow-capped mountain evokes a deep sense of awe and transcendence primal and modern--a cultural multi-faceted diamond that inspires and confounds; it's always changing, never staying still."